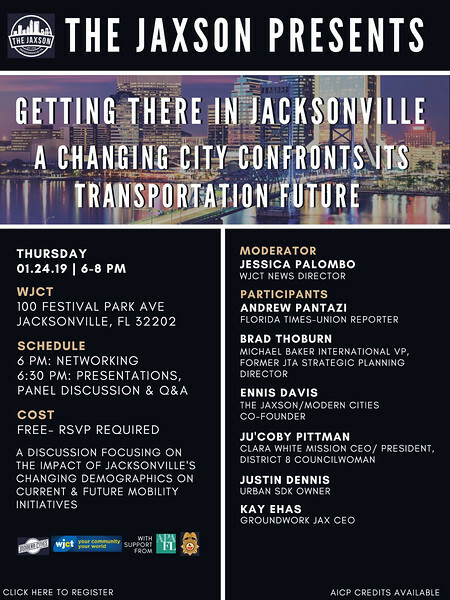 Join The Jaxson tonight for a free discussion focusing on the impact of Jacksonville's changing demographics on current and future transportation initiatives. From 6-8:30 p.m. Thursday, January 24, The Jaxson will be hosting our second live event. Join our panel for a discussion on Jacksonville’s changing demographics and its impact on local mobility initiatives and investments ranging from shared use paths and complete streets, to bike share and high frequency reliable transit options. Entrance is free, but RSVPs are required via Eventbrite. The event is presented by The Jaxson, Modern Cities, and WJCT, with support from The Jacksonville Police and Fire Pension Fund and Young Planners of the First Coast APA. Refreshments and light hors d’ouevres will be served.